So I previously mentioned I am now the happy owner of a drum carder. I bought a used Fancy Kitty "Kitten" in July. It hasn't made much of an appearance here because carding alpaca in summer heat and humidity is a misery, and I've been gradually building up enough of a fiber stash to really be able to make batts. Perhaps it seems odd that a closet full of fiber isn't enough to get started, but I have a lot of washed natural fleeces and hand-dyed roving and batts, and nothing in between. I want to spin the pretty roving I buy off Etsy and at festivals, not mash it through the carder. The October Phat Fiber theme is "Masquerade". I was stumped for a minute and then thought of one of my favorite movies - "Labyrinth". 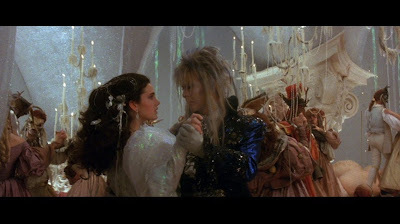 Near the end, there's a scene where Jennifer Connelly and David Bowie are at a Masqerade ball. She's wearing a shimmering white gown that flashes green and blue when the light hits it and she's draped with silver and gold jewelry. He moves through the crowd in a stunning deep blue jacket crusted with gold and silver jewels. They were my inspiration for two different sets of batts. The "Jareth" batts are made with hand-dyed organic merino from ExtremeSpinning. I asked her for a custom order and she knew exactly what I was talking about since she loves the movie too. Before long, a box of goodies arrived on my doorstep and I was able to get to work. I blended the merino with a little bit of hand-dyed tussah silk, black carbonized bamboo and five colors of angelina. These shimmer so much, but it's more subtle. It's tough to call something that glitters really masculine, but I do feel these have a manly sparkle. I ran them through the carder once. It's hard to believe such well-behaved rovings turned into this huge pile of batts. I carded them one more time and the colors blended a little more and turned into these soft, squishable, gorgeous puffs of fiber. I have more of these since I ordered plenty of fiber, but it's still so difficult to put them up for sale. I keep reminding myself that my fiber addiction has to learn to pay for itself or else! The Phat Fiber box videos are up and Ambrosia and Bliss is at 7:45 in the first one. Jessie made me blush with her description of my batts. I always thought I was alone in liking Labyrinth, but apparently there are a lot of us out there! I was giddy with delight and anticipation watching these videos. There is so much angelina in this month's box so my sparkle-loving heart is going to be happy with whatever surprises she sends. I think this is my favorite month yet based on the videos!